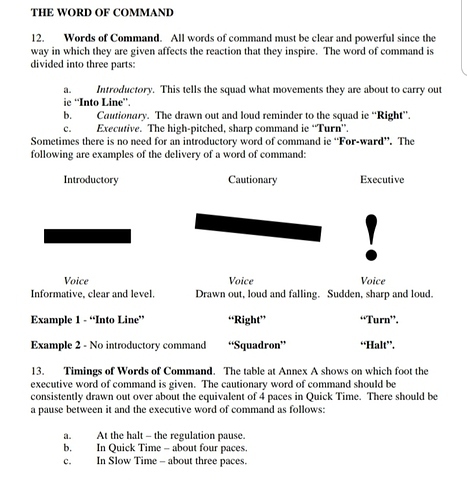 Hello i’ve been a cpl for a while now and I have just started to take a flight etc and I have never been taught how to say commands. I get told to say commands from my chest but not my voice if this makes sense. I used to be able to do it but like as I haven’t done it for a very long time, I just don’t know how to do it. If someone could guide me / maybe teach me some how on here then that would be great. Its very difficult to explain how to over a forum how to do it correctly. The best thing to do is lots and lots of practice. Ive attached the extract from AP818 to give you the technical guidance. Go on YouTube, search for Trooping the Colour, Sandhurst Parade, RAF Parade or other generic search terms, and listen to how drill commands are made. Pick a style you like and that suits you, and copy and modify it. Make it yours. Thank you I understand it will be hard thank you for this sheet ill will try learn from it. Remember to keep your diction clear - the cadets on parade need to understand what you’re saying! I concur.Make sure you never gabble .Also being clear and concise is the key.I had a female cadet many years ago who was a very intelligent and very good SNCO. Her achilles heel was when she was on the drill square.She was too quiet.She was a bit like Sgt Wilson from Dads Army.“Be so kind as to fall in”“Do you think thats wise sir”.Lovely lass though. The technical aspect of “using your diaphragm” rather than your throat is tricky. Very few people ever get it right so don’t focus on that just yet. Make sure you annunciate, as others have said. The most common problem with cadet drill commands is that they run them together with odd emphasis. Exactly. The exact way of it being said isn’t too important (in my opinion); just needs to be loud and clear, divided up into the three stages as in the documetn: Introductory, Cautionary and Executive. 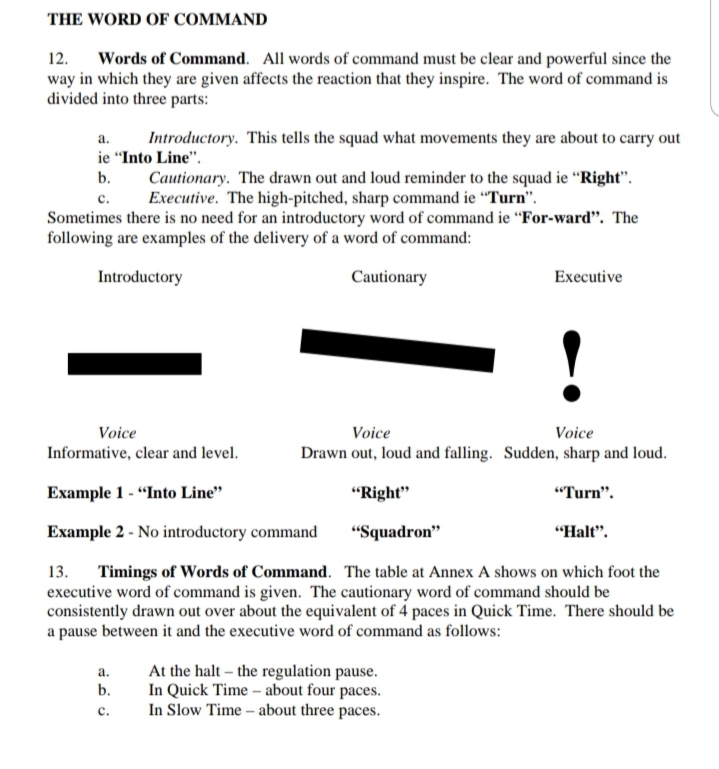 I have recently had the privilege of being given the duty to give the commands at an inspection to my CCF flight (in open order, march etc) and as long as you’re loud and clear (and obviously get the wording of the orders right!) you’ll be good to go!